When I was a kid, I loved Cinnamon Toast Crunch. But cereal is awful for you. It’s just a huge bowl of insulin spike, and a fat storage party in your body from all the high glycemic ingredients (wheat, sugar, fake foods). There is nothing healthy about cereal (and “whole grains” is a marketing ploy to make you think you are making a better choice, but you’re not). But now I’ve remade one of my favorite cereals into a super healthy keto version! Once melted, stir or whisk in the cinnamon, powdered sweetener, stevia drops, and vanilla extract. Stir until it’s a golden brown liquid with no sweetener or cinnamon chunks. 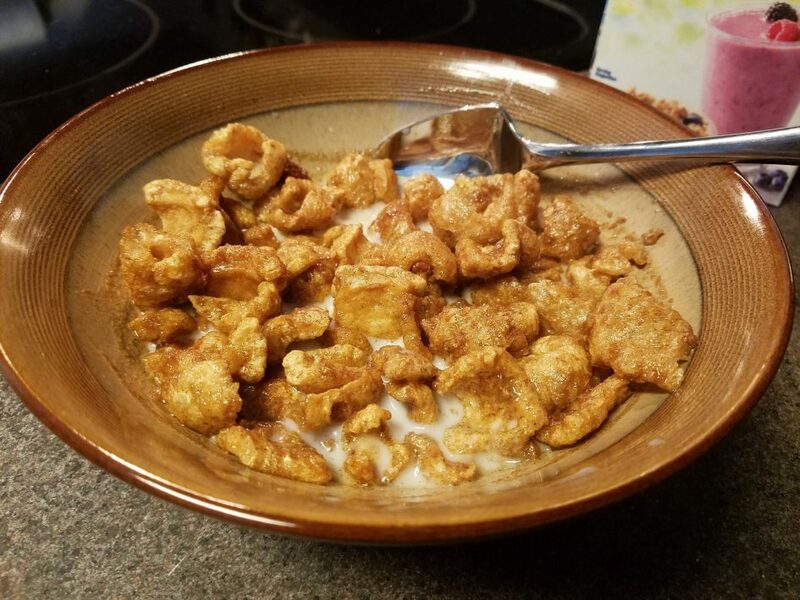 Crumble the pork rinds into the liquid into small bite-sized pieces, similar in size to cereal. NOTE: Use the fluffier pork rinds vs. the over-cooked harder pieces. Fluffier ones take the flavor better and more resemble cereal. With a spoon, stir the pork rinds into the liquid for a couple minutes until all liquid is soaked up and every pork rind piece is covered. If you have leftover liquid, add a little bit more pork rinds. Pour almond milk over the cereal and enjoy! To make this paleo, you could also sub the butter for coconut oil, but the cold almond milk will cause the oil to harden a little and may cause an awkward layer in the bowl and in your mouth. It’s still good though. I hate pork rinds by themselves but this recipe is so good!! I will be eating this again soon!